This quick chicken brine results in the most tender and juicy chicken ever. Plus, it’s so easy to make and brines a whole chicken or chicken parts in just a couple of hours. You probably know that brining your chicken helps impart a rich, savory taste and creates an unbelievably moist, tender texture. But how often do you brine your chicken? Once a year, except that chicken is a turkey? Only when you remember the night before? I’m no good at that “let marinate overnight” junk – I’m just not that organized, and honestly, most of the time I don’t decide what we’re eating on any given night until that morning! Cravings rule our home, but I haven’t figured out a way around that just yet. This quick brine is everything I ever wanted and more (no hyperbole, I swear). It’s flavorful, simple, and quick. You only need a couple of hours for this brine, making it totally doable when you remember that, oh yeah, you have to cook dinner tonight, just like every night. You know that’s how it happens…at least in our house. 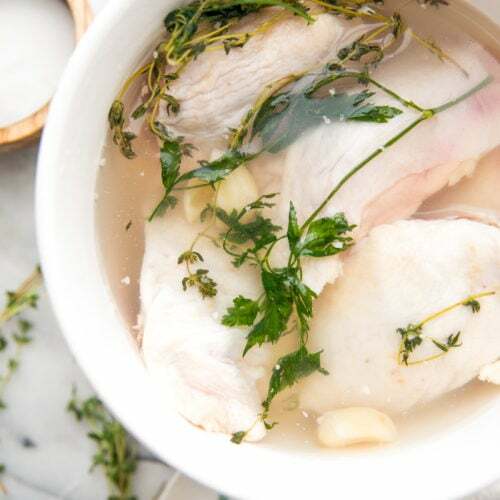 The salt solution is the perfect ratio to infuse the chicken with flavor and tender tenderness in just a few hours, without over-salting the bird. The original ratio comes from Mark Ruhlman, who wrote the book Ratio, so the man knows his ratio-related stuff. This quick chicken brine produces the most tender, flavorful chicken with the crispiest skin. You can include garlic, peppercorns, herbs, citrus, or any other aromatics you might fancy, but it works wonders on the taste of your lowly chicken without all the fancy add-ins, too. Especially if you’re stretching a chicken to use over several recipes, this basic salt+water gig can be the best choice, so you don’t find yourself with rosemary-infused chicken in, I don’t know, a Thai dish. Could be cool, but… probably not your favorite. I like to brine my chicken in the morning, then drain after a few hours, and let air dry in the fridge until I’m ready to use. Air drying allows the skin to really dry out, so that when you sear, fry, or roast it, the skin gets unbuh-buh-believably crisp and delicious. Is there anything worse than flabby, rubbery skin? No, there’s nothing worse, except that new Miley Cyrus video. Am I the only one finding myself begging for Hannah Montana to make a comeback? Like.. a permanent comeback? I digress. We’ve all had overcooked chicken – not so good, right? What a chicken brine does is two things: it gives the poultry flavor and keeps it juicy. When you brine chicken, you’re essentially installing a failsafe on your dish. You have more wiggle room to cook the bird without it becoming dry after one minute too long in the oven, and you have creative control over the flavors you’d like to lend to the entire muscle meat of your chicken, not just what you’re seasoning it with right before cooking. How do you make a brine? Brining is a simple concept: when making a wet brine, you make a salt solution and flavor it with spices, herbs, and sometimes sugar. Just how high the salt content will depend on how quickly you want to brine the meat – this brine, for instance, has a higher salt content so you can brine quickly. Whereas, with your Thanksgiving turkey, you reduce the overall salt density so you can brine it longer. This is necessary because that dang bird is so big! 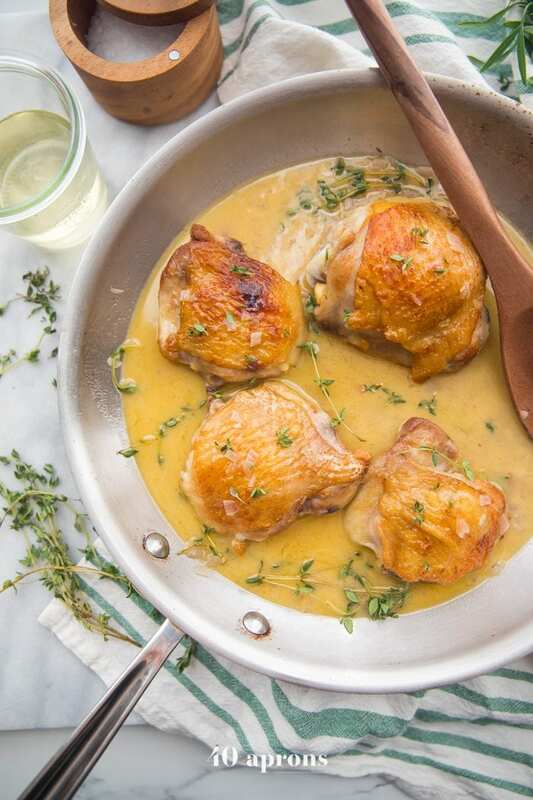 Many people season their brine with sugar, too, but we a) don’t love sugar in our food and b) find that a salt-only brine produces a super versatile chicken that truly just tastes better and more tender and juicier. After you make your brine, you’ll fully submerge your bird (or bird pieces!) in the liquid for the recommended amount of time, then remove, pat super, super dry, and cook like normal. You can make a dry brine, too! You simply leave the “wet” out – the water, vinegar, whatever sort of liquid you’re using there. Learn more about dry brining chicken here. This quick chicken brine works for a couple of reasons: the content of salt is higher than most brines, so it works more effectively quicker than a standard brine. 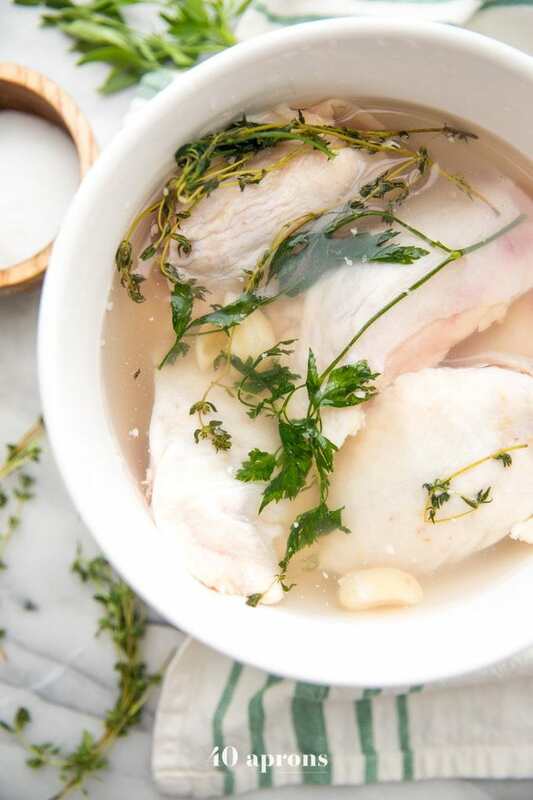 And by including fresh garlic and herbs, you’re imparting a rich flavor to the entire chicken meat, rather than just seasoning the surface in a recipe. Using ice to cool down the hot salt solution quickly makes this chicken brine super easy and speedy. Don’t over-brine the chicken! The salt solution is higher than your standard overnight brine, so you want to make sure to limit your brining time to 2-3 hours at room temperature or 4-6 hours in the fridge. Make sure you actually weigh your ingredients to make sure you have the exact right proportions. This digital scale is a great kitchen item to have on hand anyway! 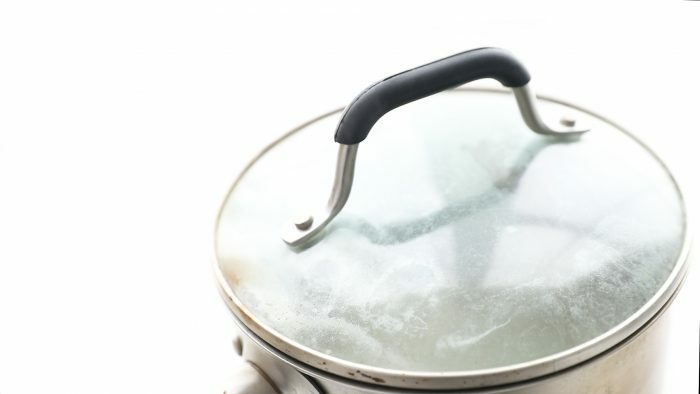 Dissolve the salt completely before you take it off the heat. After brining, salt your chicken skin only lightly before cooking. Use fresh cilantro and a sliced fresh jalapeño for Mexican chicken brine vibes. Lightly crush a few black peppercorns underneath a heavy skillet and add those to your chicken brine. Experiment with different fresh herbs and dried spices. 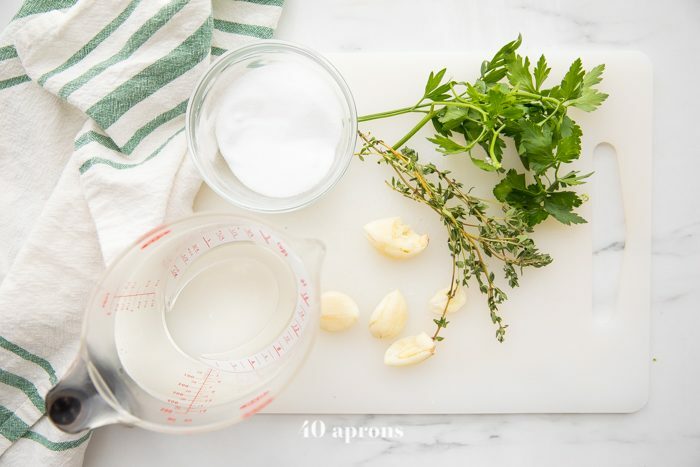 You need just a few things: water, salt, smashed garlic, and a couple of sprigs of fresh herbs. 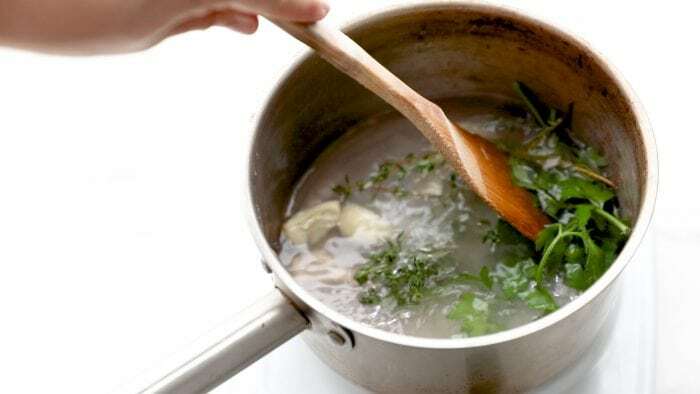 Combine your water, salt, garlic, and herbs in a saucepan and dissolve the salt completely. Bring to a boil. Remove from heat and cover. Let stand 10 minutes. Pour hot brine over ice and stir to dissolve completely. Add chicken or chicken pieces and brine for 2-3 hours at room temperature or 4-6 hours in the refrigerator. Drain, discard herbs and garlic, and pat very, very dry. Use in any recipe, but make sure to salt the chicken pieces very lightly. Can chicken be brined too long? Yes! Please, please do not brine your chicken using this recipe for longer than the recommended time. If you do, you can end up with quick salty poultry! The same goes for other, “slower” brines. If you give your chicken too much time in the brine, too much of the salt solution will permeate the meat, resulting in an oversalted bird. No good! You’re looking for that sweet spot where your poultry has had enough time to brine to become super tender and flavorful but not so long that salt dominates the taste. Follow the recipe directions, and I think you’ll be happy! How long does it take to brine a chicken breast? If you’re brining boneless, skinless chicken breasts, you can get away with brining them at room temperature for about 30 minutes or chill for about 1 hour. Using brine is the absolute key to the moistest and most tender chicken breasts you’ve ever had! Did you make and love this recipe? Give your review below! 👇 And make sure to share your creations by tagging me on Instagram! 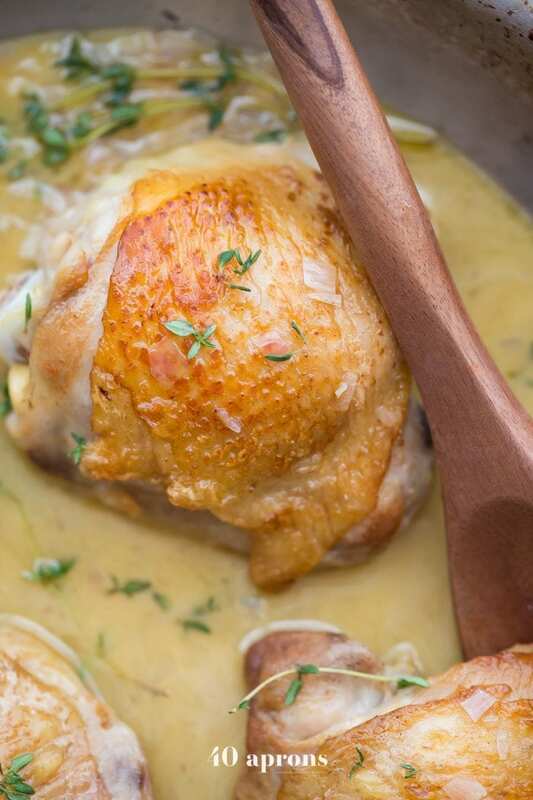 An easy, quick chicken brine that creates the most flavorful and tender chicken and poultry. Combine water, salt, and aromatics (garlic, herbs, etc.) in a medium saucepan over high heat. Bring to a boil. Cover and remove from heat. Let stand for 10 minutes. 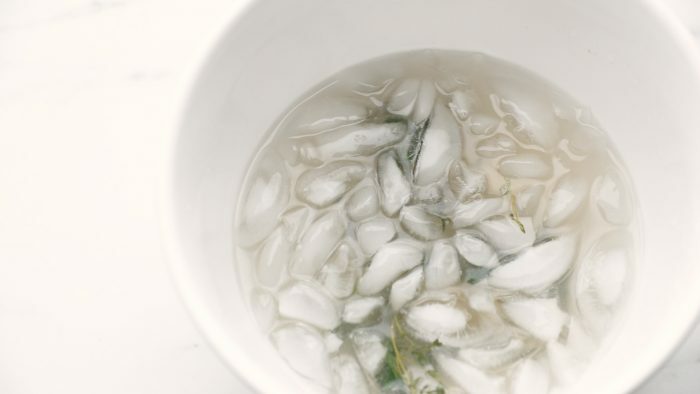 Place ice (or ice water) in a large bowl (or very large measuring cup) and pour brine over ice. Stir until ice is melted. Place chicken in a large plastic bag and pour brine over chicken. Seal and let sit at room temperature for 2 to 3 hours, or refrigerate for 4 to 6 hours. Drain chicken and pat dry. Use in any recipe, but make sure to only lightly salt the chicken surface once you've brined it. Try these extras or include your own. I keep mine simple. This recipe was originally published in October 2013 but was updated with new tips, photos, and video in June 2018. I used this on chicken breasts and for the first time ever my husband was ok with having chicken for dinner. Yay! I guess this is our new go to. We use this every time and it’s always delicious. It’s so simple and easy to follow, but it makes the chicken so good. If you plan to cook it in the Instant Pot, should you brine the chicken? Love this recipe, especially now since my fresh herbs are coming into bloom. Thank you! This makes the best chicken! I never knew brining chicken could be so easy!! I always find it o be so complicated but you made it to simple! Thanks I will be trying this oh so soon!! Right?! I used to avoid it for the same reason but now I can’t bring myself to eat an unbrined bird! It’s super effective AND so quick!